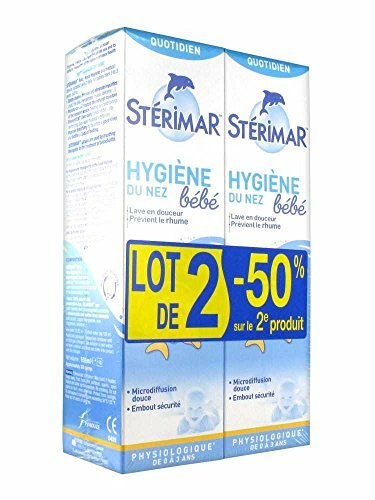 Stérimar Baby Nasal Hygiene 100 ml is recommended to wash baby's and children's noses: - Each day: it helps clear baby's nose from impurities, facilitates breathing and eating (bottle taking facilitated) and strengthens the protection of the nasal mucosa. - For prevention of ENT diseases. Specially desinged for baby's nose, Sterimar Baby ensures a soft cleansing, thanks to the soft nozzle and tip, and to the fineness of the microdiffusion. Sterimar baby can thus be used daily. Assists with ENT disorders (sinusitis, colds, hayfever, allergies, dry and stuffy noses). If you have any questions about this product by Stérimar, contact us by completing and submitting the form below. If you are looking for a specif part number, please include it with your message.